With its tropical climate Malaysia has an abundant of exotic fruit trees. Some are seasonal like the durian and rambutans. And others are available all year round. During the fruit season sometime between May to September, you will find fruit stalls popping out everywhere. Along the highways some reststops have even added shoplots selling local fruits like the reststop in Tapah and Bukit Gantang. Below are a few of some of the must try fruits. This is a must try when you are in Malaysia. If you have never experienced a durian ,it is most definitely something that MUST be tried at least once in your lifetime. 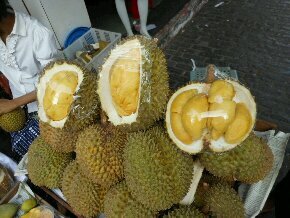 Durian is lovingly called the “King of Fruits” by its fans. A quote that I like about this fruit is from a French man. He says eating durian is like eating custard on a toilet seat. It smells like hell but taste like heaven. Durian is a seasonal fruit which normally lasts from June until August, similar to other Malaysian fruits like mangosteen, jackfruit, and mango. The durian fruit is the size of a football with a rough and thorny skin around it. The tree can grow up to a height of 50 meters and have a long life. Ripe and ready to eat durians normally fall naturally, That is why you can’t pluck durian fruits you have to wait for it to fall. Which is good as the tree is so high. So avoid standing under durian trees especially during their fruit season. You might get a thorny head ache. To get to its soft custard pulp, you need to cut open its thick thorny crust. I can go on and on about this wonderful fruit but I think you better let your tastebuds be the judge. But a word of advise eat this fruit in moderation cause this is a very heaty fruit. If you eat alot you will feel very hot the whole day. Now there are a few Rest and Relax Stops in Malaysia that have stalls selling local fruits one such area is the Bukit Gantang Rest Stop. If Durian is refered to as the King of Fruits, then Mangosteen is often called the Queen of Fruits. Legend has it the the former queen of England, Queen Victoria was so taken by this fruit that she offered Knighthood to anyone who could bring her fresh supplies. I think that’s why its called the Queen of Fruits.Its the size of a tennis ball, purple in or maroon in colour.The fruit inside is white in colour. It is easy to open by merely pressing between the palms until the shell cracks. Care must be taken when opening the fruit, as the reddish-black skin gives out a purplish juice that stains fabric and can be almost impossible to remove. This is the reason why together with durian, mangosteen is ban in hotels. The rambutan fruit season takes place twice a year. The word “rambut” in ‘rambutan’ means “hairy ” in Malay which refers to its hairy exterior. In this hairy exterior you will find a white, almost translucent egg shaped fruit similar to lychees or longans. To get to this fruit you can use a sharp knife to cut around the hairy skin then twist off the top half of its skin. Break open to its fruit. Or you can do what I normally do. Use my teeth and bite down gently. As the fruit inside normally very sweet inside, it attracts large ants that sting painfully. So you must be really careful when you bite down or you might get a swollen lip. Jackfruit is the larger version of the Durian but its thorns are not as sharp niether is its smell not as strong as the durian. A jackfruit or ‘ Nangka’ as its known in, Malaysia can weight up to 20 Kg, therefore its the largest fruit in the world. You need a sharp knife to cut it open and inside it are many bright yellow yummy crunchy segments. They taste sweet and has a very enticing aroma. That’s why when you visit some plantations you will see that the fruits are covered with a cloth or bag to avoid animals getting to it. The jackfruit is also coated with batter and deepfried. Its usually served as an afternoon tea snack together with banana fritters. Rose Apple also known as “Jambu Air” is one of my favourite fruits to munch. The Jambu Air is a bell-shaped fruitThe flesh is scented, juicy and slightly sweet. which is juicy, crispy and crunchy. That’s why its called “Jambu Air” when litterally translated to English means “Water Guava”. Like apples, jambu air can eaten whole. You can a small bag of already cut fruits at most rest stop and its a great thirst quencher while driving in the Malaysian hit weather. Some like to dip it in a rojak sauce.